I’m feeling nostalgic today, and the truly dreadful weather is keeping me well and truly indoors, in my book-lined office. Looking around the shelves of books, they’re a real mix, modern novels sitting shoulder-by-shoulder with classic literature. Two short shelves hold my work books – copies of the Writer’s Handbook, a thesaurus and dictionaries. Four much longer shelves hold my horsy library – mostly reference books and autobiographies. A small section on the bottom shelf, however, is reserved for pony books. When I was little, I owned dozens and dozens of the Pullein-Thompson sisters’ finest, along with piles of other books. Over the years, these have mostly been given away to friends with horsy children, but a few have escaped the cull. These are the books that have some special significance, or that I just didn’t want to get rid of. 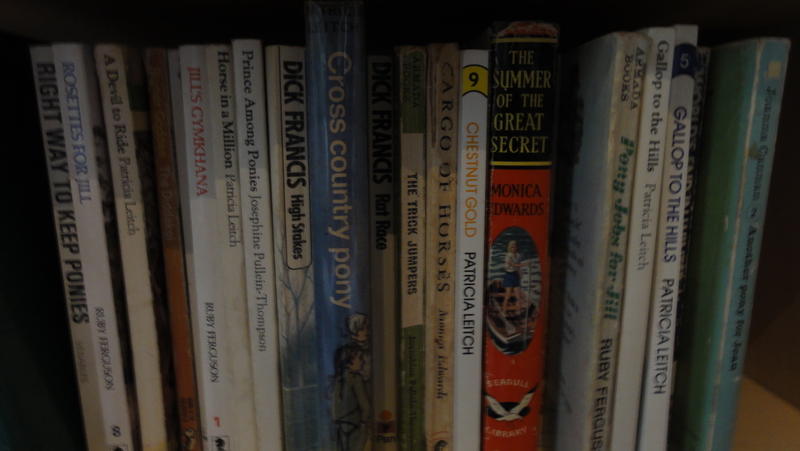 Many of these books were bought before I ever owned a real pony, and for a long time were the nearest I got. The copies are battered now, and I’m not sure I’ll ever read them again, but they’re a part of my horsy background. The Jill books. Written by Ruby Ferguson (1899 – 1966), these are the chronicles of a 1950s pony-mad teenager and her friends. I have several first editions, but these are still in print and as popular as ever. Patricia Leitch’s Jinny series. I loved these stories, about a girl who lived in a remote part of Scotland and had her own Arabian mare. In fact, I thought I was Jinny. I think part of the attraction was that they were being written to coincide with my childhood – the first book came out in 1976, and the last in 1988, which was pretty much the period that I was the right age to read them. These are also still in print. Various Pullein-Thompson novels. The three sisters Josephine, Diana and Christine Pullein-Thompson are the doyennes of pony literature, and wrote dozens of books between the 1940s and the 1990s. Many of the books were one-offs, but some were a series, such as Christine’s Black Pony Inn books. Many of their books are still in print, but the early editions are worth seeking out if you can find them – they’re such nice-looking books. Monica Dickens, 1915 – 1992, great-granddaughter of Charles. Monica wrote the World’s End series, about a family living in a former inn in the remote countryside. The books aren’t strictly pony books, more tales of a family who keeps ponies. These are sadly out of print, but it looks as though they might be available in electronic format shortly, which would help make them accessible to a new generation. 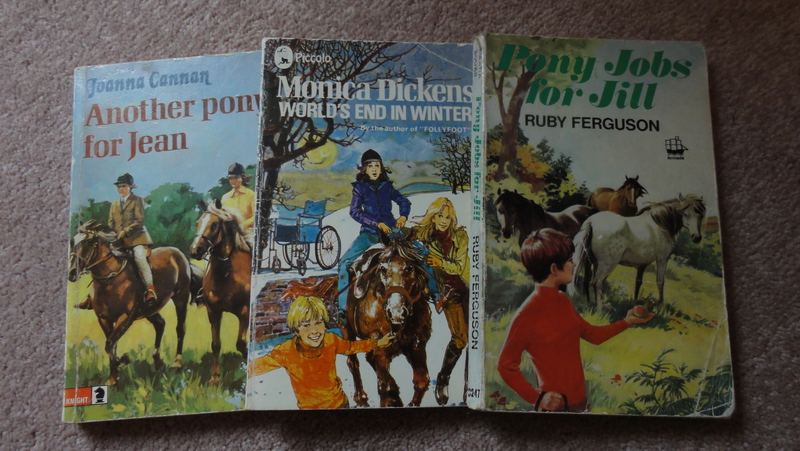 Monica also wrote the Follyfoot series, about a horse rescue centre – great characterisation, and lots of nice little sub-stories. Honorable mentions: KM Peyton’s Flambards series, Monica Edwards’ Punchbowl Farm books, and Joanna Cannan’s books. Joanna was the Pullein-Thompson sisters’ mother, and wrote the first real pony books. These are very hard to get of hold of now, so if you see one in a charity shop, grab it! My favourite non-fiction book is a wonderful faded hardback called Riding Reflections by Piero Santini, published in 1933. It contains lovely observations on ‘The Geometry of the Forward Seat’, and the author notes that while he’s in favour of women adopting the rather daring astride position (as opposed to side-saddle), he does like them to look smart. This is illustrated with a line drawing of a lady with shingled hair, wearing a soft cloche hat and a long covert coat, as we all do when we go out for a quick hack these days. I think part of the attraction of these books for me is their link to a specific time in my life, when when horses were even more important to me than they are now. I do know I’m not planning to get rid of my library any time soon. PS. If you’re trying to track down a particular old favourite, Jane Badger, the UK’s only pony book specialist, might be able to help. Thank you for the mention. I’ve just had a lovely time squinting sideways at all the titles. Like you, I still have all my old books, even though I now have other editions of some of them. That photo only shows a small selection – I didn’t want the whole blogosphere to know just how many children’s books I still own! At one point, I owned both an original and a ‘reading copy’ of every Jill book – I think most of the modern ones have fallen by the wayside now, but I’ve still got all the old ones. I love the illustrations as much as the text. *whispers* it does make me feel a little better, thank you! Hi Sara, various books you mention bring back many memories, particulary the Follyfoot series and Edward used to skive off from school at any opportunity and cycle up to the Punch Bowl Farm. It was where his love for farming started. He tells me Monica’s husband, Bill, had a tractor sooooo old it didn’t even have hydraulics. Fancy that! ( yawn!). Apparently he used to go and stay there after he left school and it is was where he first met Siamese and Burmese cats. Sorry about yr weather, we had 32 C degrees here today!! Sally. Ps Ed is mentioned in the foreword of one of Monica Dicken’s books where one of the their Burmese cats fell through the ceiling onto his bed one night…. Sally, that’s amazing! I must have a chat with Ed next time I see you both; sounds really interesting. Please try and remember which book Ed is mentioned in, I want to look it up! Sorry Sara, I meant Edward is mentoned in Monica Edwards’ book “The cats of Punch Bowl Farm”, not Monica Dickens! We have a copy here she signed for him and he is mentioned in the foreword. Apparently the cat story is featured, but I don’t remember it, so am going to read it again. Sally. Don’t worry Sally, I was keeping up with you as to which Monica it was! Would love to see the book next time we catch up. Keeping your copy of Black Beauty is completely normal. You’re also allowed to have My Friend Flicka and anything by Kipling. If you have whole shelves like me (and, apparently, Jane Badget), it starts to get a little less excusable….! Ps came across my original copy of Black Beauty too whilst hunting for above book, which I’ve been unable to part with all these years, sigh…..